I am loving teaching the Light Project students in Pauline studies- today has been megga busy, ‘full on’ with teaching and application. In the midst of it all I keep dipping into a book that has blown me away. 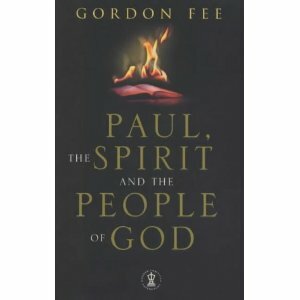 It is by Gordon Fee, Paul, The Spirit and the People of God. 1. Cultural relevance and the reality of the Spirits presence are directly linked. 2. The Spirit is given for: Fruit, witness and gifts. 3. The Spirit is the fulfilment of Jewish hopes of the return of the divine presence. 4. The Spirit reveals the NOW but NOT YET of the future Kingdom. 5. The Spirit gives new birth- salvation in Christ. 6. The Spirit creates a people who live out the future life of God in the present age. 7. The Spirit is the ‘key player’ in worship and the whole body is built up. If the church is going to be effective in our postmodern world, we need to stop paying mere lip service to the Spirit and to recapture Paul’s perspective: the Spirit as the experienced, empowering return of God’s own personal presence in and among us, who enables us to live as a radically eschatological people in the present world while we await consummation. All the rest, including fruit and gifts (that is ethical life and charismatic utterances in worship), serve the Lord. What a refreshing book… so good. Wow! This book sounds really good, Chris. I might just have to buy a copy. I’ll probably head down to Cornerstone tomorrow to grab one or order a copy if it’s not in stock. WOW!! Good stuff, but the shame is that throughout church history, the person & work of the Holy Spirit, has been something that has divided Christians? The hymn “All to Jesus I surrender” comes to mind… anyway, enough waffle! Sounds good. Is that an if/of typo in point 1 of Fee’s thesis? Otherwise it doesn’t quite make sense to me.